« London Rivers Week: Balsam, Birding and Beer! Join Thames21 and The Conservation Volunteers (TCV) for an outdoor Green Gym and conservation activity, and a Nature walk around the river Pinn. 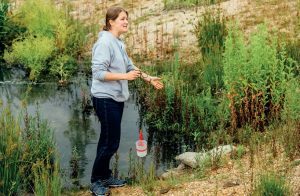 The Nature Walk will explore the habitats of the River Pinn and Hillingdon Leisure Centre Pond. Learn about the wildlife of the area, while getting a gentle workout.